Did you know that there’s some people out there who have not only started their Christmas Shopping, they’ve finished it too! Not me. I must admit I’ve made a start but I’m far from finished. I hope you haven’t finished either because I have some great Special Offers to tell you about. New for 2017 we have 14 Special Offer packs featuring our popular Christmas Dog Bandana designs and some savings!!! I realise it’s not life-changing discount but every little helps! We have 10 different Christmas Twin Pack combinations and 4 Dog Bandana Offer Packs each containing 3 Christmas Bandanas. You may need to read that again! Alternatively you can just go and look at the Christmas Special Offers in our Multi-buys section. They’re also listed in our Christmas Department too. 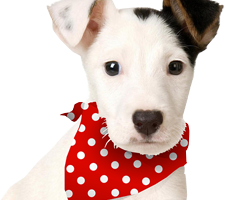 Special Offer Dog Bandana packs contain old and new designs but they are all everso nice! Offer packs can be purchased in 3 sizes, extra small, small to medium or medium to large. All bandanas are individually wrapped and each bandana in the offer pack is supplied in the same size. 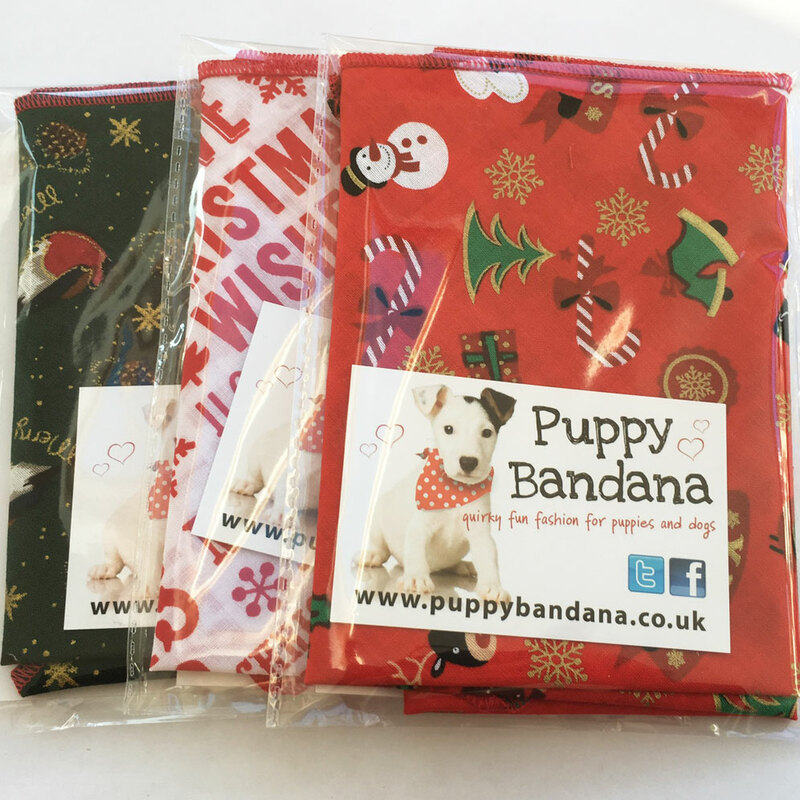 Christmas is just starting to happen here at Puppy Bandana and the last few weeks have seen a steady increase in the number of Christmas patterns going out in the post so please place your order now to avoid disappointment – you don’t want to let your pooch down! Christmas Dog Bandana Multi-buys include It’s Christmas, All Wrapped Up Twin Pack, 3 x Smiley Snowman and many more. 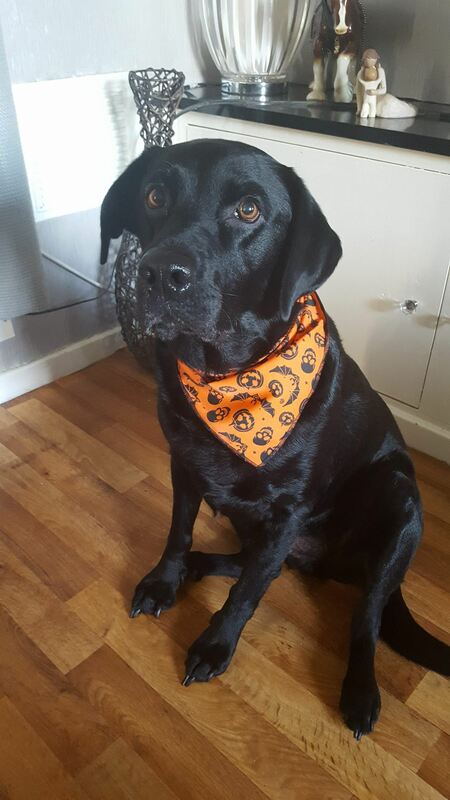 Here’s wishing Charli-brown a howling great Halloween in his new Halloween Bats and Pumpkins Dog Bandana. Thanks for wearing and sharing. 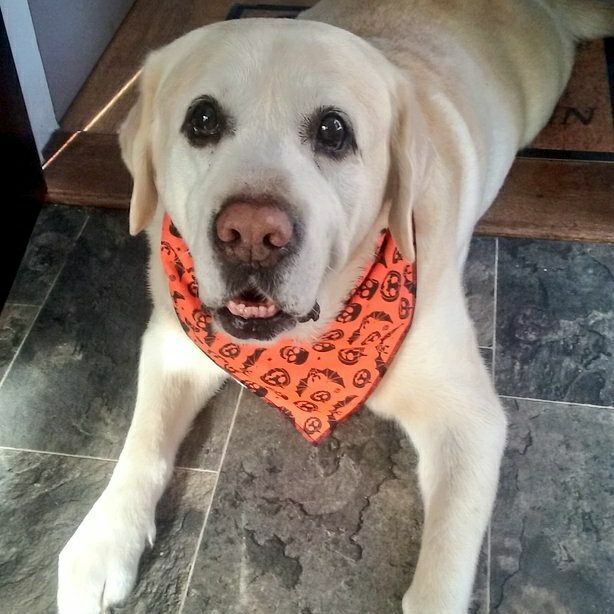 It’s not too late to order your Halloween Dog Bandanas from Puppy Bandana. We’ll hop on the Puppy Bandana broomstick and fly down to the local Post Office and they’ll be with you in plenty of time for Halloween. Some designs are running a little low but we still have plenty of our brand new design Halloween Bats and Pumpkins which is available in both Black and Orange and in a money saving twin pack offer too! What a handsome boy Cooper is eh?! Haunting good looks, particularly in his Halloween Bats and Pumpkins! Happy Halloween and thanks for wearing and sharing Cooper. See Cooper in our Puppy Bandana Photo Gallery and on Facebook and Instagram. 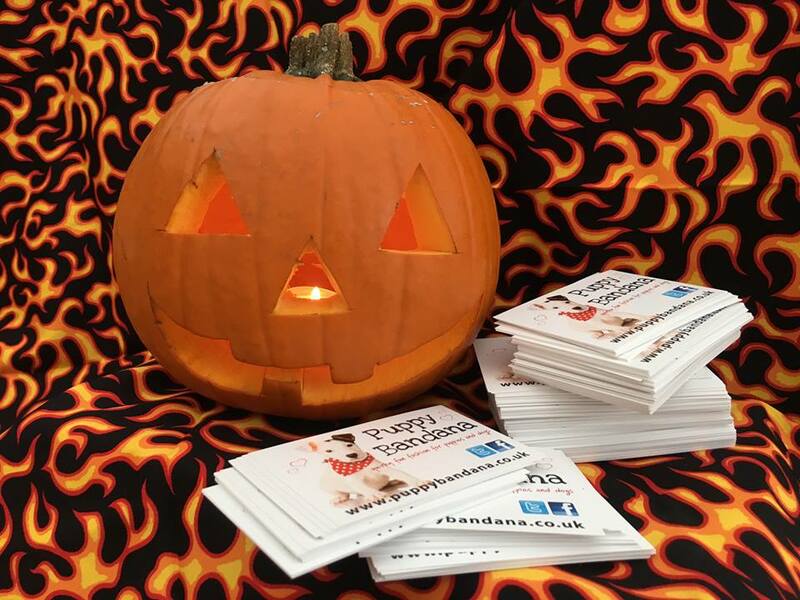 Luna has sent us a Halloween treat – what a great photo! Thanks so much for sharing it with us. We love Luna’s pic so much we’re going to share it with everyone on the PB Blog, on our Facebook page, Instagram (how modern!) 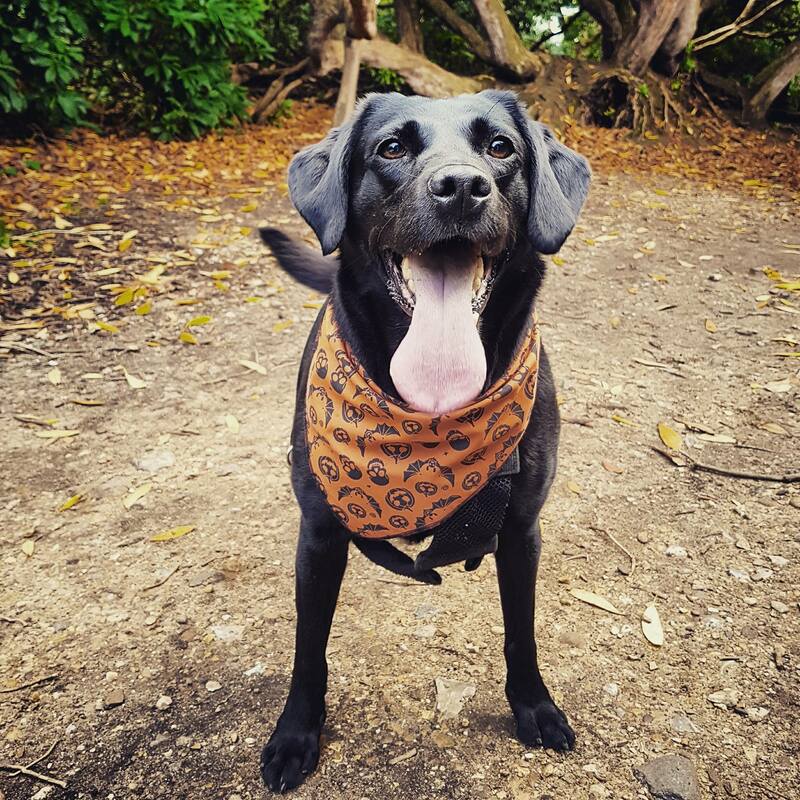 and we’re also going to pop the lovely Luna on duty in the Puppy Bandana Shop selling our Halloween Bats and Pumpkins Dog Bandana in Orange.